"My therapist tole me the way to achieve true inner peace is to finish what I start. So far today, I have finished 2 bags of M&M's and a chocolate cake. I feel better already." PS, I'm with Dave Berry, gotta go finish some chocolate! I knew you'd do something amazing and you didn't disappoint! And you included M&Ms, TWs face candy. I love the kitty paws holding up the globe and I love your last quote as a bit of humor to set off the rest. Peace be with you, now and always. Mommy's two faves: M&M's and world peace. You rock, Katie! We is right there with yous Katie and Glowgirly! Mommy say especially when it involves chocolate. 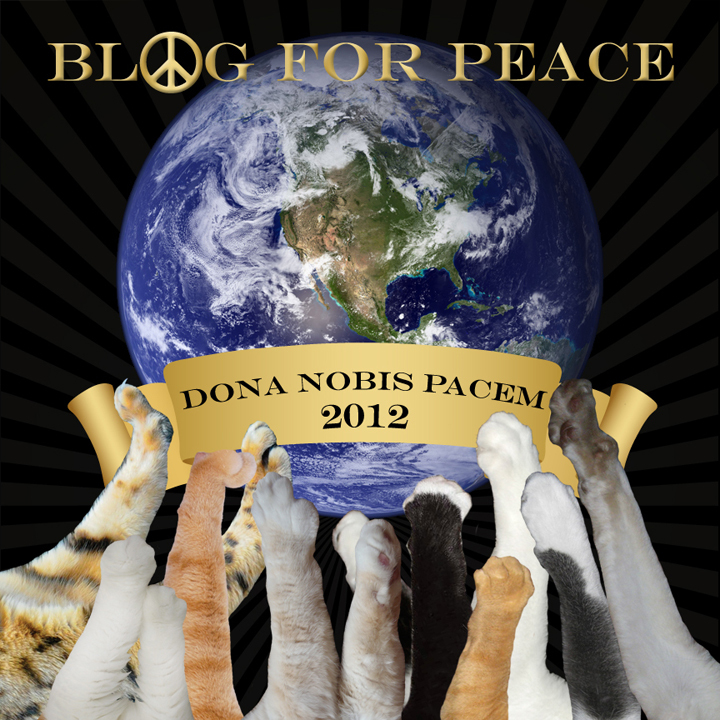 We too are purring for peace... although I wish my human had taken more time to put together our peace globe! Heh. Speedy is doing another hoppy bunny dance for peace! My son has a tshirt that reads, "save our world, it's the only one with chocolate!". I think that's as good a place to start as any. Great post today. Wishing you peace. Really love the globe, well done. We're purring for peace today, and always, too. And now we're going to listen to Dave Barry. Come on, Mommy. Hand over all the jerky in the dehydrator...NOW! Beautiful! Peace to the paws and their people. Now is good. Love and peace Katie !!!! This is pawsome. We LOVE your peace globe, it is simply amazing. We love your Peace Globe! And the mom says she'll go with Dave Berry...she's off to find some chocolate cake. GREAT peace globe, dear friends! Peace and love to you, today and every day. Hi Katie, we're more aligned with Dave Barry's thought. However we'll have to substitute the M&Ms and chocolate cake for bison jerky and sweet potato "fries". We have wild salmon jerky for you if you'd like to visit. Nice! Purring with you for peace! Harley and I join you in purring for peace! I'm stealing your peace photo K? Great Peace Globe! We're purring for peace today too. We are also purring for peace, Katie. You have a beautiful graphic and all those kitty arms upraised are purrfect! We join you in wishing for peace throughout the world. Peace to you and yours on this Blog Blast Day and in all the days to come. Love and peace to all the kitties around the globe! Now see, that's how the Humans SHOULD be but are not. I think the Cat Ruler of the World should step in and show them how it's done. PEACE , LOVE and UNDERSTANDING to you !